Miller Harris scents are widely available nowadays, but for the limited editions and other specialities, you need to visit one of the Miller Harris stores. The flagship London store is on Bruton Street, Mayfair, next door but one to Berkeley Square (where the fictional Bertie Wooster lived with Jeeves). 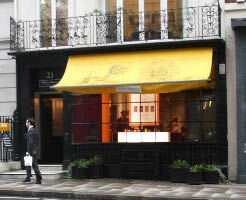 The shop can be identified by its bright yellow awning, patterned with the trademark Miller Harris design. This awning has a secondary benefit — inside the shop, it feels as if the sun is beaming in, even on a dull, wet March afternoon. The front of the shop is dedicated to fragrance, candles and bath & body products. There are urns, from which Lyn Harris's selected single-note oils — Rose Absolute, Sage Dalmation and Mandarin Green — can be dispensed. The displays are grouped by scent, with all products available in a specific scent presented in the same place. Bottles can be engraved (this is fairly expensive) for gifting purposes. Samples are willingly given. In fact, they've stopped selling their splendid sample pack offering, as the full set was apparently too much for most customers. The shop has recently opened a tea-room, which is at the back of the shop. A range of three teas, specially selected by Lyn Harris, are served in bone china cups and teapots. The crockery comes in all kinds of patterns and shapes, which makes for a rather charming cottage-y feel, although scattered around the tables, the magazines include Vogue, Vanity Fair and Elle Decor, which tells you that the customers are probably not cottage-dwellers (unless the 'cottage' is a ten bedroom manor in North Yorkshire). The seats and banquettes are upholstered in the Miller Harris signature fabric. You can also buy the tea in caddies and pouches — Thé Bergamot, Thé Pétales and Thé Fumé. Best seller: "The classics, such as Citron Citron and Le Petit Grain, sell well. Terre d'Iris is very popular, and Terre de Bois is in the top three." Getting there: Miller Harris, 21 Bruton Street, Mayfair, London W1J 6QD. Tel: 0207-629-7751. Nearest tube station: Green Park. Nearby: A few doors along is the Stella McCartney flagship store, which usually has something controversial and eye-catching as its display. Don't miss: You're right next to Berkeley Square, where the traffic zooms round the outside of a charming central park. Have a good look at the London plane trees here — they're apparently among the oldest in London, and from the thickness and shape of the trunks you can see how spectacularly pollarded they've been over the centuries.